History has been made at the COP21 climate change conference in Paris as world leaders agreed to adopt an "ambitious and balanced" final deal, including a "legally-binding" agreement to keep global warming "well below 2C". After nearly two weeks of intensive negotiations, details of the final text were presented by UN Secretary-General Ban Ki-moon, COP21 President Laurent Fabius, and French President Francois Hollande this morning (12 December). The 31-page final text was then released an hour later and, crucially, it contained no brackets - which indicate areas of disagreement. The ambitious nature of the document was well-received among politicians, green groups and industry alike. But a deal was not done yet. After another agonising six-hour delay, Fabius and his team emerged. The COP21 President finally brought the gavel down and declared the global climate agreement formally adopted, generating a standing ovation at Le Bourget in north-east Paris. On global warming (page 2), the deal "emphasises with serious concern" the need to hold the increase in the global average temperature to "well below 2C" above pre-industrial levels, and "pursuing efforts to limit the temperature increase to 1.5C". To achieve this long-term temperature target, the text states: "Parties aim to reach global peaking of greenhouse gas emissions as soon as possible, recognising that peaking will take longer for developing country Parties." It also includes a ratcheting mechanism on climate action, with countries having to "communicate a nationally-determined contribution" to reducing global emissions every five years. The first "global stocktake" will take place in 2023 and every five years thereafter. Some aspects of this agreement are "legally-binding", such as submitting an emissions reduction target and the regular review of that goal. However, the targets set by nations are not binding under this deal. On the key issue of 'differentiation' (page 21) - which refers to the different roles and responsibilities of developed and developing nations in addressing climate change - the text continues where it left off with the previous version; recognises that a peaking of greenhouse gas emissions "will take longer in developing countries". Developed country should "continue taking the lead" by undertaking economy-wide absolute emission reduction targets, while developing countries "should continue enhancing their mitigation efforts", and are encouraged to move over time towards economy-wide emission reduction or limitation targets. The issue of 'loss and damage' (page 7) - which essentially considers the compensation for nations dealing with climate impacts - was given its own Article in the text. It agrees a $100bn-a-year price floor to support developing nations in their climate change mitigation efforts, but crucially the document states that this Article "does not involve or provide a basis for any liability or compensation" for loss and damage - which should keep the US happy. What's NOT in the text? One notable exclusion from this final text is a clear timescale of when fossil fuels must be phased out in the second half of the century. The previous draft said countries would "work towards reaching greenhouse gas emissions neutrality in the second half of the century". The final text doesn't. Another area that is not mentioned - as with previous draft texts - is the shipping and aviation industries - responsible for around 5% of global emissions but growing rapidly. 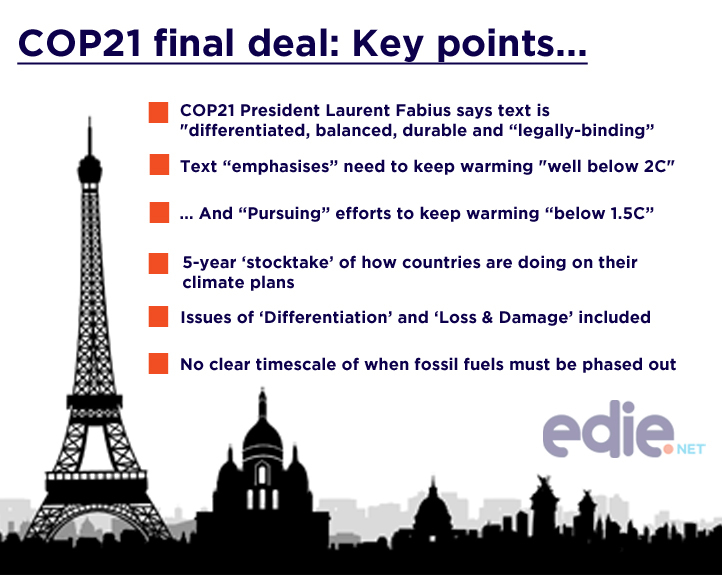 Fabius has, however, hailed an "historic" COP21 meeting, claiming the final text "contains the principle elements that we thought would be impossible to achieve". The text is "differentiated, balanced, durable, legally-binding" and will limit global warming to "well below two degrees", Fabius said. "It always seems impossible until it's done. None of us acting alone can be successful. Success is built collectively. In this room, you are going to be deciding upon an historic agreement. "The world is holding its breath. It counts on all of us." This final text is is predicted to be officially adopted when the Conference Of Partis reconvenes later this afternoon, so long as there are no objections raised in a ministerial meeting later this morning. In this morning's session, Ki-moon said "we need all hands on deck" to ensure the text is fully agreed upon and enacted. "The solutions to climate change are on the table - they are ours for the taking," he said. Hollande added: "We will not be judged on a clause in a sentence, but on the text as a whole. History is here - all conditions have been met. There will be no putting this off. A decisive agreement for the planet is here now." The final text was apparently only finalised at 6.45am this morning, after negotiators and ministers worked through Wednesday, Thursday and Friday nights at Le Bourget in north-east Paris. Regardless of the ambition of this final text, many observers are confident that the past two weeks in Paris have sent clear signals to businesses, investors and consumers that a low-carbon economy is a globally-shared goal. Edward Cameron, managing director of lobby group Business for Social Responsibility (BSR), said: “We’re seeing the core building blocks of a new economy coming from this process. Business has come here in unprecedented numbers, to demonstrate their own commitment to acting on climate, and to work with governments to create a truly catalytic instrument for the real economy." Big business commitments came in spades throughout the conference, from new carbon reduction targets of 114 firms including Coca-Cola, Sony and Procter & Gamble, to deforestation pledges from Unilever and Marks and Spencer’s, as well commitments to 100% renewable energy from the likes of Google, Adobe and BMW, among others. Analysts also agree that we will see a significant shift in the global financial system as a result of these talks. During the conference, awareness-raising organisation 350.org announced that the global divestment movement now features organisations controlling assets worth $3.4trn, while massive banks and insurers have pledged to scale-up green finance. The Governor of the Bank of England Mark Carney also helped a new climate change disclosure taskforce, which aims to provide investors with details on company’s climate resilience. "This is not just about mobilising $100bn per year - it is about creating a leverage mechanism to bring private finance into this equation so that we get to trillions.," added Cameron from BSR. So... was COP21 a success? Professor Lord Nicholas Stern, chair of the renowned Grantham Research Institute, believes the COP21 event has achieved its underlying objectives. Stern said: “In many ways, this summit has already been a success with more than 180 countries having submitted pledges for action. Over 150 world leaders participated in the opening of the summit and announced a range of initiatives such as Mission Innovation. There has been good will and a spirit throughout these two weeks of negotiation. All these are signs of success. Despite the cries of success and failure from campaigners and negotiators alike, the true impact of the conference will, of course, not be known for several years yet.